A lot has been said about sighting and follow-through. But how much do you actually see during sighting and follow­ through? Whilst striving for that perfect sight picture, everything is working for you with the trigger pressure being applied consistently and smoothly to the rear. The shot breaks and the pistol recoils. Most shooters at this stage endeavour to "call" the shot (nominate its placement on the target) based on what sight picture they saw the moment the shot broke. The shooter scopes the target and instinctively looks in the general direction of the shot call. "What, its not there!" comes the cry. Does this sound familiar? Well, do not despair, the answer may be at hand. If your attention, or concentration, is not on SEEING the sights through the shot release, it may cause erratic shot nomination. 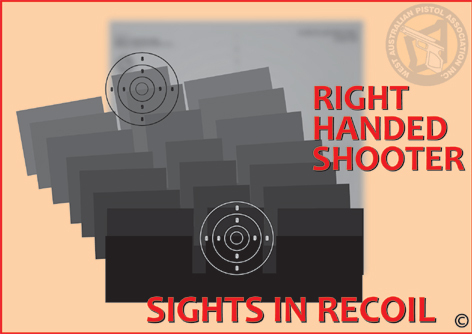 All this means is this: to obtain a better understanding of what to look for in the calling of a shot (or string of shots) you must be striving to see the front sight actually starting to go into recoil and rise slightly within the rear sight. Due to the inertia of the recoil the entire pistol will rise slightly, but the front sight will rise slightly more than the rear sight. The object is to SEE the front sight through the shot release and continue the trigger pressure through the entire sequence and follow-through. Having seen the sights through the shot, take note of the placement of the sights after recoil above the target. If all aspects of the shot are correctly performed, such as smooth trigger press, then where the sights finish after the shot break should be the same area for each shot. 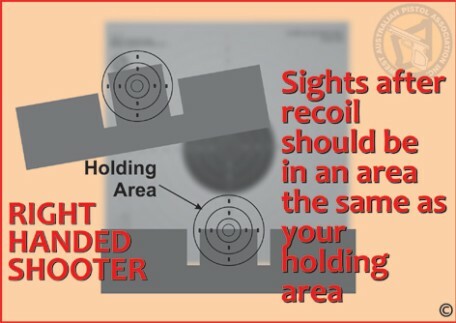 If for instance, you tend to hold in an area the size of the eight ring below the black, then as the recoil has stopped, the sights should finish above the target in an area equivalent to the holding area. 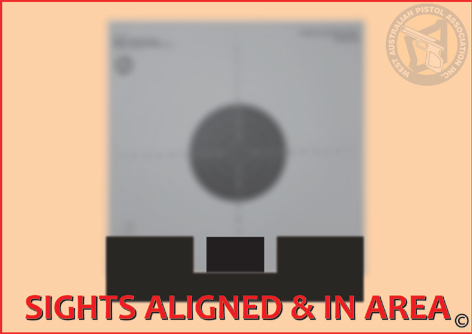 If you find that the position of the sights are not in the same area after the shot release, but in an area far greater than your holding ability, then this may point towards trigger problems, looking at the target, loose wrist or grip or you may simply not be SEEING the sights through the shot into follow-through. The diagrams below shows what you should be seeing as the shot is fired. Also diagrams of what to look for if things are not going to plan. Target out of focus and front sight clear and aligned in the rear sight. Diagram showing follow through and how the sights move during recoil. Diagram showing follow through and how the sights Appear after recoil has finished. Note the area that the sights 'finish' is the same size as the area of hold. Any difference in position usually means a lack of follow-through and/or bad trigger press.